Every passenger knows the feeling of frustration that comes when the airplane is on the ground and you have to wait in a long line just to get the chance to take off, or even to park at a gate. Sometimes this waiting game can go on for several hours. Last week, AirSafeNews.com identified US airline flights that had delays of four hours or more in 2009. In today's article, we are offering a different set of statistics from the US Department of Transportation (DOT) that provide summaries of flights delayed two hours or more, and details about individual flights delayed at least three hours. One of the most reliable sources of information for US airline data and statistics is the DOT's Bureau of Transportation Statistics (BTS). One of its newest reports provides information on departure delays that includes details on individual flights that were delayed three hours or more, as well as summaries of departure delays by airline and by airport. 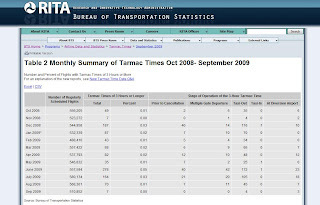 One table provides a monthly summary of tarmac delays from October 2008 to September 2009, and it shows that over that 12-month period, there were about 6.5 million flights and 1,097 experienced tarmac delays of three hours or more. June 2009 had the most delays of this type with 278, and November 2008 and September 2009 were tied for the month with the fewest delays at seven. 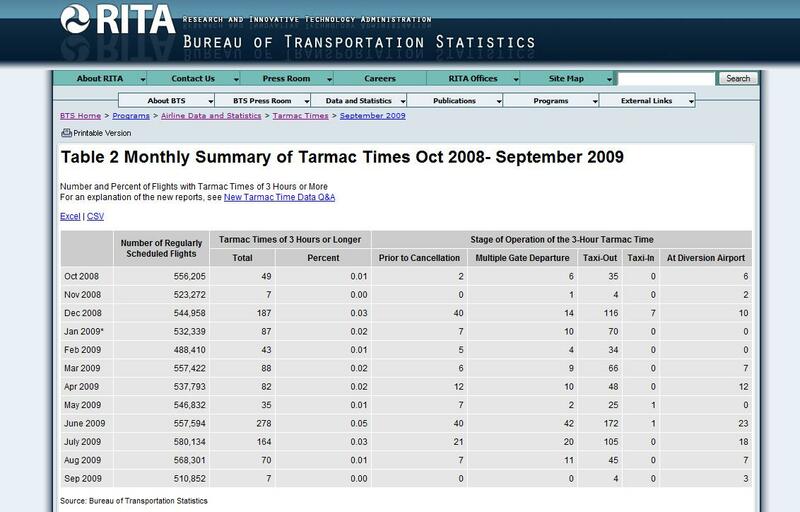 Much more detail is available on the September 2009 summary, where the BTS listed the record of individual carriers with significant tarmac delays. The BTS breaks down information by individual carrier. For example, if you review the September 2009 carrier summary for delay data, you will find how many times each of the reviewed airlines had delays of two hours or more. All the charts mentioned in this article also provide links to spreadsheets so you can download the data and more easily perform your own detailed analysis. While the BTS data is quite detailed for larger airlines, data from all airlines are not included in these reports. Only the 19 largest airlines are required to report air travel statistics to the DOT. This would exclude delay information from smaller airlines and from non-US airlines. The delay data provided by the DOT is quite valuable in that it provides everyone with a good general understanding of how bad delays can get. If you have been on a plane in one of these extreme delay situations, we'd like to hear from you. Please visit the AirSafe.com Online Complaint Form and share your experience, even if it did not involve an airliner flight in the US. We'd like to post one or more of these stories on FlightsGoneBad.com.